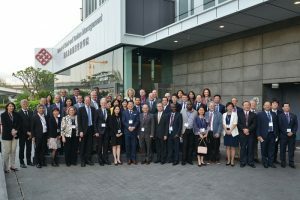 Hong Kong – June 1, 2018 (travelindex.com) – Initiated and hosted by the School of Hotel and Tourism Management (SHTM) of The Hong Kong Polytechnic University (PolyU), the first ever World Summit for Deans of Independent Schools of Hospitality and Tourism was held at Hotel ICON on 27-29 May 2018. The Summit provided a unique platform for deans of 40 institutions from more than 20 countries and regions to discuss and define the future course of strategies for hospitality and tourism schools, and to share solutions to common issues in an effort to promote further growth of hospitality and tourism studies within comprehensive universities. On 28 May, the Summit was opened with welcoming remarks by Professor Timothy W. Tong, PolyU President, and Professor Kaye Chon, SHTM Dean, Chair Professor and Walter Kwok Foundation Professor in International Hospitality Management. Dr Alison Lloyd, Director of Institutional Research and Planning Office and Director of International Affairs Office, PolyU, then gave a special presentation on the Matrix for Ranking of Hospitality and Tourism Schools. Chaired by Professor Brian King, SHTM Associate Dean, the first session entitled Academic Programmes for Quality of Teaching and Learning included presentations by Dr Lea R. Dopson, Dean, Collins College of Hospitality Management, California State Polytechnic University, USA; Mr Jos van der Sterren, Dean, Academy for Tourism, NHTV Breda University of Applied Science, The Netherlands; and Professor Hsin-Wen Chang, Dean, College of Tourism, Chung Hua University, Taiwan. Entitled Research Productivity and Administration, the second meeting session was chaired by Professor Haiyan Song, SHTM Associate Dean and Mr and Mrs Chan Chak Fu Professor in International Tourism. It featured Dr Florian Aubke, Dean of the Undergraduate School, Department of Tourism and Service Management, MODUL University Vienna, Austria; Professor Jigang Bao, Dean, School of Tourism Management, Sun Yat-Sen University, China; and Professor Dennis E. Reynolds, Dean, Conrad N. Hilton College of Hotel and Restaurant Management, University of Houston, USA. Featuring Dr Lilibeth Aragon, Dean, College of International Tourism and Hospitality Management, Lyceum of the Philippines University, Philippines; Dr Chris Bottrill, Immediate Past Dean, Faculty of Global and Community Studies, Capilano University, Canada; and Professor Patrick J. Moreo, Dean, College of Hospitality & Tourism Leadership, University of South Florida Sarasota-Manatee, USA, the third meeting session entitled Industry Partnerships and Student Development was chaired by Dr Tony Tse, SHTM Professor of Practice (Industry Partnerships). Chaired by Dr Catherine Cheung, SHTM Associate Dean, and entitled Internationalisation and International Collaborations, the final meeting session featured Dr Ricard Santomà, Dean, School of Tourism and Hospitality Management Sant Ignasi, Ramon Llull University, Spain; Ms Sandra Zubieta Zamudio, Dean, College of Hospitality Management, Tourism Administration and Gastronomy, Universidad San Ignacio de Loyola, Peru; and Professor Lin Wang, Dean, HNU-ASU Joint International Tourism College, Hainan University, China. Another highlight of the Summit was the Group Discussion Session entitled Top 3 Priority Strategies for Hospitality and Tourism Schools Collectively in the Next 10 Years chaired by Dean Kaye Chon. This session featured Dr Donald Farr, Director, Dedman School of Hospitality, Florida State University, USA; Professor Rhodri Thomas, Dean, School of Events, Tourism & Hospitality Management, Leeds Beckett University, UK; Dr Neethiahnanthan Ari Ragavan, Executive Dean, Faculty of Hospitality, Food and Leisure Management, Taylor’s University, Malaysia; and Professor Edieser Dela Santa, Dean, Asian Institute of Tourism, University of the Philippines Diliman, Philippines. For close to 40 years, PolyU’s School of Hotel and Tourism Management has refined a distinctive vision of hospitality and tourism education and become a world-leading hotel and tourism school. Rated No. 1 in the world in the “Hospitality and Tourism Management” category according to ShanghaiRanking’s Global Ranking of Academic Subjects 2017, placed No. 1 in the world in the “Hospitality, Leisure, Sport & Tourism” subject area by the CWUR Rankings by Subject 2017 and ranked among the top 3 “Hospitality and Leisure Management” institutions globally in the QS World University Rankings by Subject 2017 and 2018, the SHTM is a symbol of excellence in the field, exemplifying its motto of Leading Hospitality and Tourism. With 75 academic staff drawing from 22 countries and regions, the School offers programmes at levels ranging from undergraduate degrees to doctoral degrees. In 2012, the SHTM was bestowed the McCool Breakthrough Award by the International Council on Hotel, Restaurant, and Institutional Education (I-CHRIE) recognising its breakthrough in the form of its teaching and research hotel – Hotel ICON – the heart of the School’s innovative approach to hospitality and tourism education. A member of the UNWTO Knowledge Network, the SHTM is also the editorial home of Asia Pacific Journal of Tourism Research, Journal of Travel and Tourism Marketing, Journal of Teaching in Travel and Tourism and Journal of China Tourism Research.